Reservations required for Ghosts & Gravestones Tour only. 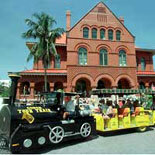 The World Famous Conch Train sightseeing tour of Key West focuses on the historic Old Town area of the island. See the famous sights that include Hemingway House, the Lighthouse, Mallory Square, Duval Street and the Historic Seaport. Then experience the darker side of Bone Island on the Ghosts & Gravestones Tour. 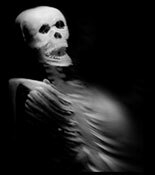 The Trolley of the Doomed will then take you to explore the eerie East Martello Fort where guests will meet Robert the Doll ~ Key West's Most Cursed Resident! Host guide you on an unforgettable adventure into the unknown.... if you dare. 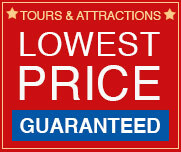 Get your eTicket, and enjoy these two great tours while visiting the Southernmost City of the USA. Conch Tour Train: Daily from 9:00 am to 4:30 pm 364 days a year. Tours depart approx. every 30 minutes. Fantasy Fest Weekend- Last full tour Fri-Oct 26th at 12:00pm. Closed on Sat Oct 27th and first tour at 10:00am on Sun Oct 28th. Ghost & Gravestones Tour - Reservations are required. Reservation based tickets and unused tickets are non-refundable. You may reschedule up to 24 hours in advance of tour time by calling 305-294-4678. Conch Tour Train - Reservations are NOT needed or accepted. 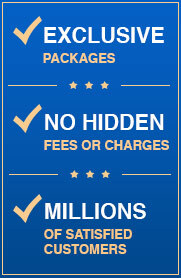 Tickets can be used on any operating day within 12 months of the purchase date. Truval Village at the Corner of Truman and Duval St. The Ghosts & Gravestones Tour is rated PG-13. Tour may not be suitable for children under 13. Conch Tour Trains depart from boarding locations approx. every 30 minutes. 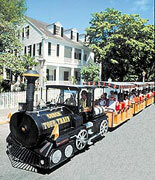 Patrons with etickets (voucher) or mobile ticket can board at any Old Town Trolley boarding location. Without a Ticket you must go to the ticket booth location with invoice order number. When purchasing eTickets for groups of 15 or more, please call Customer Service so that we may most effectively serve your needs. 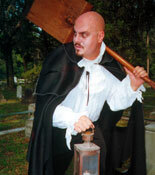 Ghosts & Gravestones Tours run most dark and stormy nights so dress appropriately. Part of tour is exploring the Civil War Fort and involves walking. Restrooms are not available during the tour. Accessible: We request 24-Hour advance notice. Please call 305-294-4678. OTT is not responsible for things left behind on the trolleys. Assistance animals, such as seeing-eye dogs, are the only animals that are allowed on board the train and trolleys.